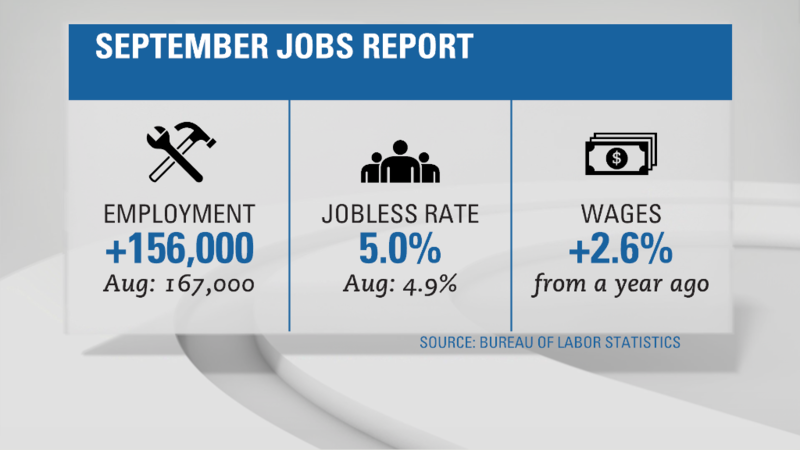 American job growth kept up its steady pace in September. America also reached a post-recession milestone: Counting September's gains, the United States has added 15 million jobs since employment hit its low in February 2010. That's the time frame the Obama administration likes to use because the country was still losing jobs in 2009. Since Obama took office in January 2009, the economy has added roughly 10.8 million jobs. Regardless of the time frame, the job market has led the country's comeback from the Great Recession, experts say. "It's really been the bright spot for the overall economic recovery," says Curt Long, chief economist at the National Association of Federal Credit Unions. Job gains in September came across the board. Professional and business services led the way, adding 67,000 jobs. Those industries have gained more than half a million jobs this year. Health care and restaurants both added more than 30,000 positions. And the energy industry finally stopped hemorrhaging jobs in September after losing 220,000 since September 2014. Dan Black helped with hiring in September. As head of recruitment in the Americas for accounting firm EY, formerly Ernst & Young, Black says the company has added 15,200 jobs in the U.S. this year between entry-level and experienced recruits. That's lower than last year, when EY hired 16,300. Black says the U.S. is in a "lukewarm economic environment." Still, he reports solid demand for EY's accounting and consulting services, and said he expects hiring next year to match this year. The uncertainty of the election, now a month away, is weighing a little on employers' minds, Black said. "Depending on who gets elected -- that will have implications on businesses that we're very much entrenched in," Black says, specifically mentioning tax policy and trade deals. But he adds: "The services we provide -- many of them are important regardless of which candidate is elected."